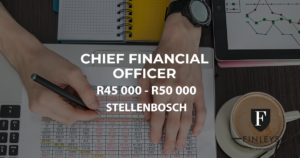 Our client is in the manufacturing and finance industry and has a vacancy for a CFO to join their new office in Stellenbosch. Our client offers a salary of R45 000 – R50 000 depending on qualification and experience. Applicants who feel they fit the above profile and meet ALL the minimum requirements are urged to apply for this position.